A Covent Garden Gilflurt's Guide to Life: "Am I Not a Man And a Brother?" Many years ago before I threw open my salon doors, I lived for a short time in the beautiful county of Staffordshire. One of the deservedly favourite sons of that area is Josiah Wedgwood, whom we have welcomed before here on these pages. Wedgwood was not only a talented businessman and inspired potter, he was also a passionate political reformer and was dedicated to the abolition of the slave trade. He first learnt of the reality of slavery from his close friend, Thomas Clarkson, and inspired by the abolitionist cause, Wedgwood produced numerous pieces featuring the seal for the Society for the Abolition of the Slave Trade. Although Wedgwood popularised this iconic image through mass-production and wide sales, he did not actually design the iconic image and this honour belongs to William Hackwood, a modeller in Wedgwood's Etruria pottery. 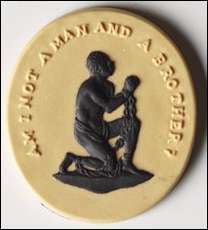 Wedgwood sent medallions to Benjamin Franklin and donated several hundred to the Society for Abolition to distribute, and soon the image became a fashionable statement. It was worn in jewellery, embedded in trinkets or even hung on walls and the image was instantly recognisable, a perfect example of where politics and art met in the long 18th century. Wonderful to see a rare reference to Thomas Clarkson. The Wedgwood image is used on Clarkson' memorial in the centre of his home town, Wisbech. Thank you; Clarkson should be more well known!